Direct Shutters | Is Your Security Screen Door Or Window Grille Up To The Job? There are national standards in place with regards to the manufacture and installation of security doors and window grilles that ensure that they are providing appropriate levels of home security. 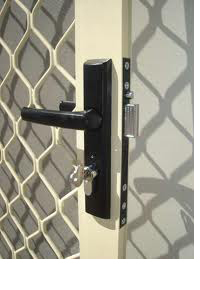 Standards Australia, an independent, not-for-profit organisation, recognised by the Australian Government as the peak non-government Standards body in Australia, has issued AS5039 which describes the standards a security screen door or window grille must achieve in its manufacture to be considered effective as means of providing protection for your home. Modern security doors have two main purposes—to keep out insects when your main interior doors are open and also to providing an additional layer of home security. Security screen doors and window grilles do an important job in helping to protect your home from intruders, so it is important to instal a high-quality product that is up to the job. AS5039 sets a standard for the quality of the materials that must be used in the manufacture of a screen for a door or window, as well as establishing levels that measure its overall strength and integrity. Therefore, it is crucial that when you are considering a new security or screen door that it adheres to this national, accepted standard. If it doesn’t, you can regard it as an inferior product and one that will not be able to to withstand the determined attempts of an intruder nor provide you and your family with the security you are looking for. Standards Australia also emphasise the importance of installation in ensuring the effectiveness of a security screen door or window (AS5040). The overall strength of a screen door or window grille depends on the integrity of the door or window frame, and the use of strong and appropriate fastenings and hinges. Therefore, you need to ensure that you employ skilled, experienced installers like Direct Shutters, who you can rely on to use robust materials that will ensure your screens are able to withstand force and any attempts to prise them off or open.